My brother-in-law introduced me to a game company several years ago that seemed to fit with the way I spent (read: didn’t spend) my money, and which he pronounced Chee Apess. The company made their games to use interchangeable bits; the only thing they sold you was the parts unique to the game (the board and the cards, generally), which made their games, well, cheap. One of their games that I bought ages ago is Kill Doctor Lucky, and it has been a game collection hit ever since. I bought Kill Doctor Lucky: The Director’s Cut for $7.50. The publisher now has this version available for free as a print-and-play, but there is also a newer, fancier version available for $29.99. Parting ways from the earlier version, the new edition includes all the pieces necessary to play. (I think you’ll be able to tell from the pictures which version is which.) So what is Kill Doctor Lucky all about, and why does it deserve its new, more expensive treatment? Kill Doctor Lucky is, essentially, Clue in reverse. 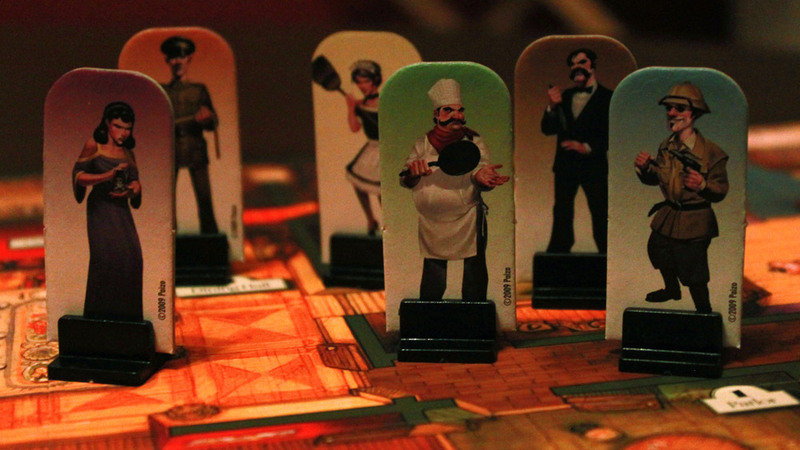 In Clue, one of you has committed a murder, and the players try to discover who did it. 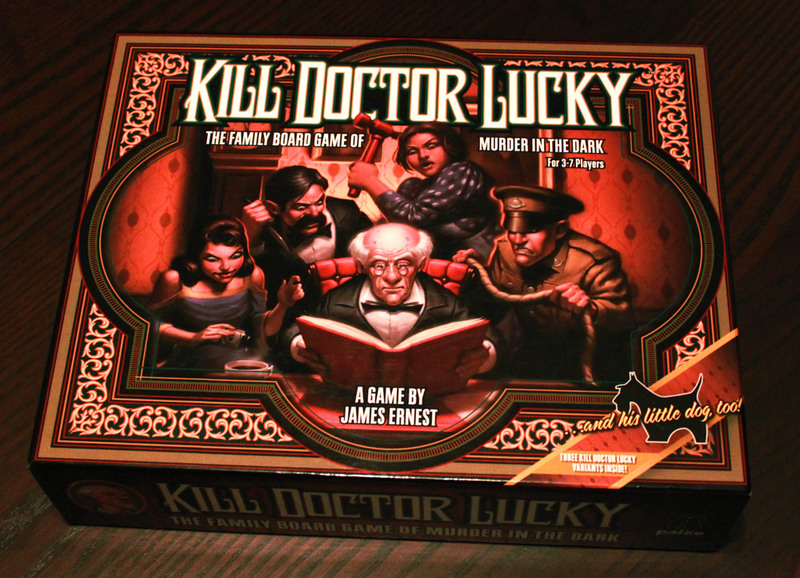 In Kill Doctor Lucky, each player is trying to get alone with the doctor just long enough to commit the crime. But Doctor Lucky is aptly named. He has a seemingly inexhaustible store of diversions, helpers, boring and distracting stories—in a word, luck—so that killing him is exceedingly difficult. 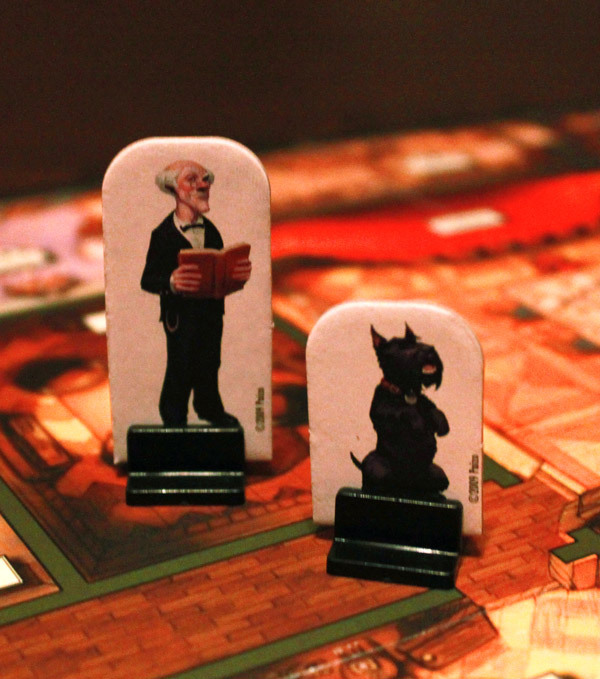 In Kill Doctor Lucky, players position themselves around the J. Robert Lucky Mansion with evil intent. 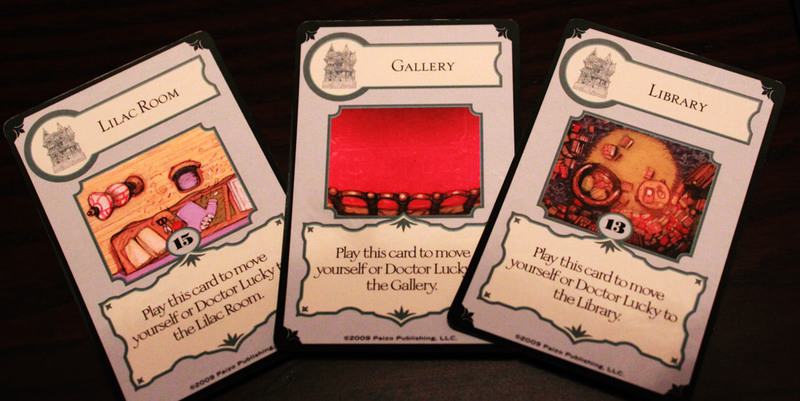 On players’ turns, they may move, play any number of cards, search a room (draw cards, if they haven’t played any cards), and attempt to kill Doctor Lucky. Play passes clockwise, with one exception: when Doctor Lucky enters an occupied room, it is automatically the player who is in that room’s turn. Doctor Lucky is a creature of habit, and he always follows a predictable path around his mansion. (The rooms on the game board are numbered for this purpose.) Because of this, turn order can jump around. Careful players can lead the doctor around his house, taking turn after turn. Players can only attempt to kill Doctor Lucky when there is no one around to see. When the player determines he is alone with the doctor, he can make his murder attempt. All murder attempts have a base value of at least one (which the rules say is akin to poking the doctor in the eye). There are weapon cards to increase the likelihood of success—weapons like a tight hat, a killing joke, a runcible spoon, a civil war cannon, and so on. Some weapons are worth more in certain rooms, so careful planning and luring of the doctor play a major role in the success of your plot. There’s the lonesome lilac room, and you can see the numbers that indicate Doctor Lucky’s path. Also, I taped the board together myself. But the doctor is not named “lucky” for nothing. Once a murder attempt has been declared, the other players, in turn order, may play failure cards that represent the doctor’s nonrenewable resource. The failure cards explain what fortunate turn of events protected the doctor this time: a wizened kung fu master intervening on his behalf, the doctor waxing rhapsodic on his recent polar expedition, an ill-placed banana peel. 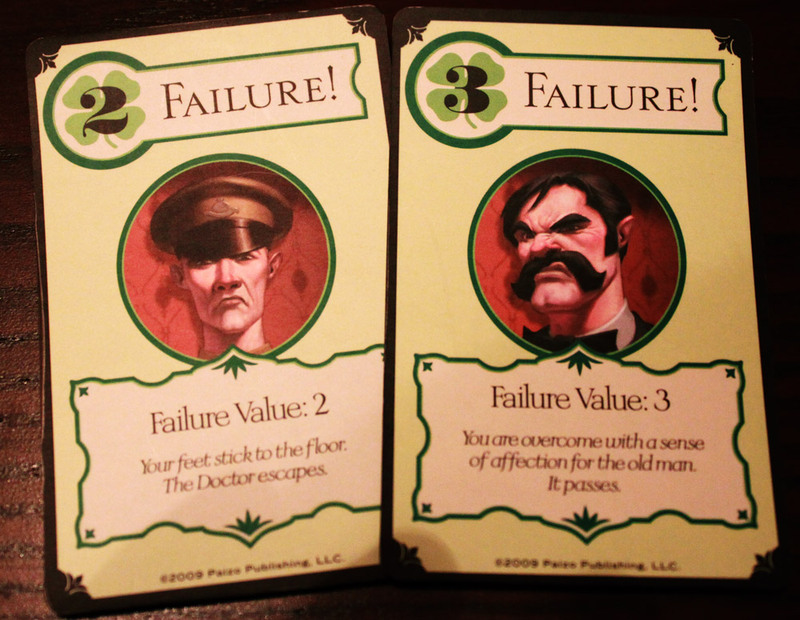 If the failure card total equals or surpasses the murder attempt’s total, the attempt fails, the doctor escapes, and the next player gets his turn. I mentioned that the doctor’s luck is a nonrenewable resource. When the draw deck is depleted, the failure cards are not shuffled into the new draw pile. In other words, there will be a time when the doctor’s luck runs out. When players try to foil a murder attempt, each player has the option to play as many cards as he wants or to pass, but once a player passes, he cannot play any more failure cards. Passing can be an effective strategy: drawing failure cards out of your opponents’ hands could make your own murder attempt more successful. But I’ve seen many games end prematurely from stingy players overestimating the doctor’s luck residing in the other players’ hands. The game ends whenever one player kills Doctor Lucky, usually within an hour. Also, for being a game with “lucky” in the title, there is a surprising amount of strategy involved. Players must be careful about luring Doctor Lucky into their traps, because if they fail, Lucky automatically escapes. The player who fails may not get another turn for a while (especially if he’s in the lilac room). Also, while the doctor can dodge attacks through his luck, the other players are always in control of just how lucky he is. It is to their benefit, obviously, that you fail in your attempt…but they’re also trying to flush the other players’ hands of failure cards for when their own turn comes. One false step could spell premature demise for the old doctor and failure for the miserly player. The game demands a healthy balance of strategy, luck, and reading your fellow players. One thing about this game that may be a turn-off to some audiences is the theme. The game is unabashedly a game about murder. However, there is a big difference between Kill Doctor Lucky and, say, Letters to Whitechapel. In Kill Doctor Lucky, there is quite a bit of levity, and at least for my sensibilities, the humor in the game, while dark, far outweighs any serious consideration of what is happening. That being said, if your family is more conservative, you may want to pass on this one altogether or until your children are old enough to understand it. But if your family plays Clue or a similar murder deduction game, this is about on par with that. Also, there are various versions of the game available. I paid for the original director’s cut (did I mention it’s now free?) and supplied my own pawns/taped the board together myself. There is a fancier version, but I like the character of my original. This self-described “family game of murder in the dark” is a humorous, surprisingly family-friendly game with enough strategy to keep a regular gamer interested. Though I own the highly polished version put out by Paizo, I learned the game with the black-and-white “Chee Apess” version. It doesn’t matter which you get; the delight of this highly thematic game comes across in the humorous weapons and flavor text of the failure cards. It’s one of the few games when the text is worth reading consistently; the cards are concise and hilarious, and they keep the game lighthearted for all players. The game is simple enough for anyone to learn. Though I compare it to Clue when I introduce it to new players, it is similar in theme (however inversely) only. There’s no bogged down roll-and-move mechanic that pointlessly slows the game. 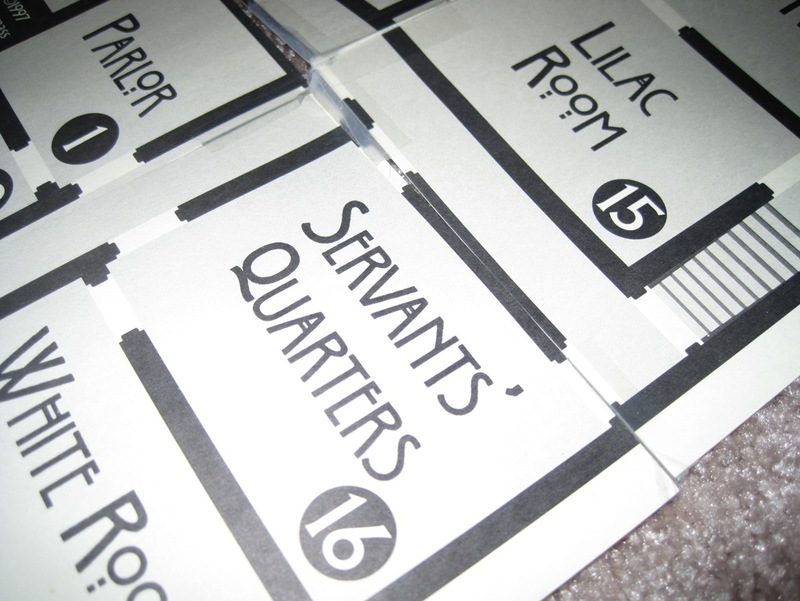 Room cards and movement cards allow you to travel throughout the whole mansion, and you always get one free move to get to the next room over. Aside from the potentially off-putting theme of attempting murder, the biggest issue that someone might have with this game is the variable turn mechanic. This element adds a bit of strategy—nothing like jumping ahead of Doctor Lucky to get three to four turns in a row to fatten your hand a bit—but it can also result in some players having to wait a long time for their turn to come around again. Especially with more players, this time can become extensive. I’ve noticed that normal turn order usually lasts an average of three turns before jumping to a different place, so with the full seven players, a few will be left waiting. Still, the game is balanced. You can’t keep your own turn going for more than three rooms without having to play a card for extra movement, and a murder attempt ends your turn immediately afterward. 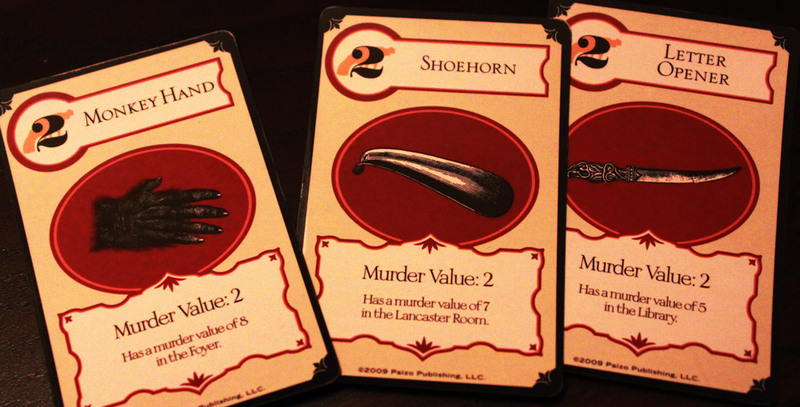 If you end up with a lot of cards and the other players have few, you will have the burden of failing out the other murders. And, fortunately, the hilarious flavor text keeps the game interesting even for those who are still waiting for their turn. This is one of the few games in which the goal of the game isn’t “to get the most points”—it’s a refreshing change of pace when teaching the game to say, “The goal of this game…is to kill Doctor Lucky.” Of course, without points, this means someone could be doing really well the whole game and then lose because someone else just happened to get a murder attempt in right after all the failure cards ran out. You may feel frustrated if you tried to kill Doctor Lucky more than anyone else, but only managed to draw out the last failure card for the next player in line to land the killing blow. The optional spite tokens in the Paizo version definitely shorten the game; they also skew the winnings towards the players who attempt murder the most. While a player could still potentially jump in right at the end and win, it’s far more likely that a player with a large number of spite tokens will have enough to push it over the edge. This should also encourage people to make more attempts at murder when they can, instead of stringing out longer turns. 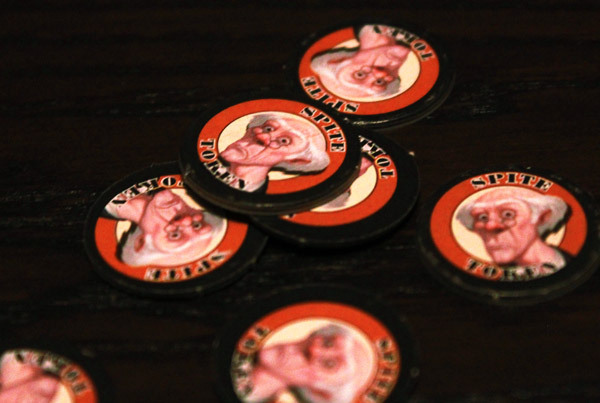 The little dog adds an element that will extend the length of the game, making it harder to get Doctor Lucky alone, but includes a few variant rules for collecting even more spite tokens. If you only have 3 players, you’ll definitely want to toss in the Little Dog – it’s too easy to get Dr. Lucky alone without it, which can result in lackluster games. Again, this is only with 3-player games. As for which version to get—I purchased the nice Paizo version for two reasons. For one, the print-and-play version was unavailable when I was looking for the game. And for the other, the full-color version looks a lot more attractive and fun to new players who will probably be judging the book by its cover. The Paizo version is very colorful with an art style that fits the game perfectly, without changing the names of the rooms or the flavor text on the cards. 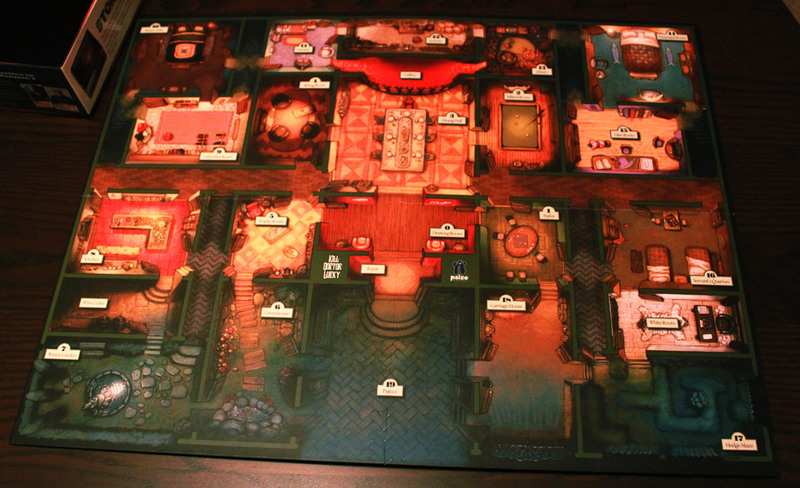 I will say one thing, though: the print-and-play mansion is a lot clearer as far as how rooms are connected and separated. Though the Paizo mansion looks beautiful, the dark green walls sometimes blend in with the shadowy room art, forcing you to look closely to see where the walls and doors lie. The black-and-white version is clear, high-contrast, and visible to everyone—even though you have to tape it together. The Paizo version does include the spite tokens and His Little Dog Too, which aren’t necessary additions but do add a little variation to the formula. Not that you couldn’t add an extra pawn and download the rules for the variation, or even add your own spite tokens. Kill Doctor Lucky is a delightful, fun game that’s sure to get some laughs and be a good time for all. Next Article NaGaDeMon: An Experiment in Futility? I unabashedly adore “Kill Doctor Lucky”! The more, the merrier! It’s a fantastic game, and it’s one of the games that brought me into board gaming as a hobby. While the game drags a bit when you have seven players crowded around a table, I still think it’s fun. I agree: the more, the merrier! I really like Kill Doctor Lucky. The first time I played it was with the Cheapass version of the game. I didn’t know that the developer decided to put a printable copy online so thanks for that! I’ve printed out a copy and I’m really excited to teach it to my gaming group. I just taught KDL to a group of friends this weekend with my newly printed copy and most of them really loved it. The one complaint I got was that one of my friends didn’t take a turn for the first half of a game because Dr. Lucky kept entering rooms with other players in them. Oh, and because I didn’t really want to print the cards on stock paper I decided to make the cards larger and print them at a standard US card size. I then sandwiched a junk common Magic: The Gathering card between the printed card face and card back and sleeved that up. (It’s what I do whenever I replicate/print game cards.) If anyone is interested in a larger card set for KDL shoot me an email (derekofminnesota@gmail.com) and I’ll send you either the card images or a PDF. Yeah, the first game can be rough on a newbie. That’s a great idea to up the size of the cards–I use standard CCG cards and sleeves for PnP games, too.